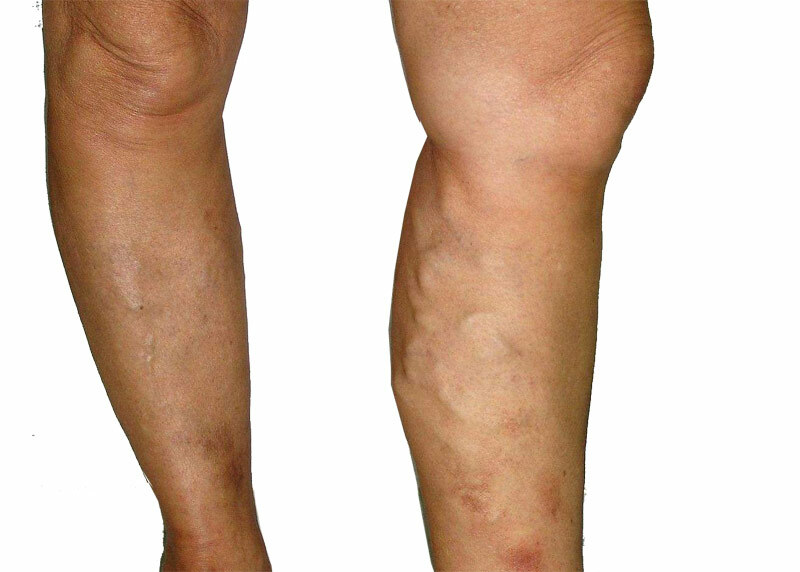 Varicose veins is a venous disorder that can cause not only the cosmetic problem but may also cause pain, leg swelling, non healing ulcer and thromboembolism. Spider veins on the other hand are small superficial blood vessels that appear red or blue in the skin. They commonly occur on the legs, but are also found on the face or other areas of the body. These dilated blood vessels may be short, unconnected lines, each about the size of a large hair, or connected in a "sunburst" pattern. They may look like a spider web or a tree with branches. Spider veins can occur in a small area where they are not very noticeable, or they can cover a large area of skin and be very unattractive. Larger dilated blood vessels called varicose veins may be raised above the skin surface and they may occur with spider veins. Patients who have these condition may experience pain that ranges from dull and throbbing to a burning sensation. The larger vessels are more likely to cause discomfort, although smaller blue veins have been shown to cause pain as well. If spider veins are bothersome, they can be treated with laser or by injection of a special solution that can destroy them. Success rate for this two procedures ranges from 80 - 90 percent. The cause of spider veins is not completely known but genetic plays a very important factor. Studies show that identical twins can actually be affected in the same area of the body and to the same extent. Spider veins appear in both men and women, but more frequently in women. Female hormones may play a role in their development. Puberty, birth control pills, pregnancy, or hormone replacement therapy may contribute to their prevalence in women. They may also appear after an injury or as a result of wearing tight girdles or hosiery held up with elastic bands. Spider veins on the nose or the cheeks of fair-skinned people however be attributed to sun exposure. IS THERE ANY MEANS TO PREVENT THE FORMATION OF SPIDER VEINS? Spider veins cannot always be prevented though studies suggest that wearing support hose may minimize unwanted blood vessels from developing. Keeping one's weight at a normal level and exercising regularly may also be helpful, as well as eating a high-fiber diet and wearing low-heeled shoes. Sun protection is also very important to limit the number of unwanted vessels from developing on the face. HOW IS VARICOSE OR SPIDER VEINS TREATED in Thailand? The first option for vein therapy in Thailand is the the injection method which is popularly called sclerotherapy. This technique has been used for spider veins removal in Thailand since the 1930's, and before that for larger veins. With this technique, several kinds of solutions called sclerosing solution is injected directly into the blood vessel with a very fine needle. The solution irritates the lining of the vessel causing it to swell, stick together, and the blood to clot. Over a period of weeks, the vessel turns into scar tissue that fades, eventually becoming barely noticeable. A single blood vessel may have to be injected more than once, some weeks or months apart, depending on its size. A number of vessels can be injected in any one-treatment session. In most cases however only a single treatment can eliminate most of the blood vessels. Occasionally, larger varicose veins are connected to them. In such cases, these vessels should be treated along with spider veins. This can be done by sclerotherapy, or the latest techniques using endovenous laser, stripping, ligation, focal removal of the dilated veins by mini vein surgery or radiofrequency. Great advances have been made in the use of ultrasound to guide the injection of sclerosing solutions. Ultrasound may be used to treat large vessels, as well. HOW ARE SPIDER VEINS ON THE FACE TREATED in Thailand? There are several ways to treat spider veins on the face. Laser, electrodesication, and intense pulsed light have been used successfully so your doctor can recommend a treatment based on your skin type. WHAT CAN YOU EXPECT AFTER VEIN THERAPY in Thailand? After a single treatment, most veins will vanish for sclerotherapy, however some patients may need more than one treatment to obtain an 80 - 100 percent improvement. Fading usually occurs over a period of months and total disappearance may take time. For lasers which have been used for more than twenty years, wavelengths of light are absorbed by the hemoglobin in the blood vessels to destroy them. Many types of lasers, pulsed dye, long-pulsed, variable-pulsed Nd-YAG, and Alexandrite may be used, as well as a non-laser intense pulsed light technique. Your dermatologist will recommend the best type of laser for you. All skin types and skin colors respond well, although some skin types require special lasers. Dermatologists may differ in their treatment instructions to patients. Most advise their patients to "clear" the sclerosing solution out of the circulation. Varicose veins is a venous disorder that can cause not only the cosmetic problem but may also cause pain, leg swelling, non healing ulcer and thromboembolism. Spider veins on the other hand are small superficial blood vessels that appear red or blue in the skin.